I didn’t realize until recently how lucky we have been – that we have not had a summer of cool and/or rainy days like some people have. It has definitely been a real summer – hot days, some humidity, lots of sun – I am NOT complaining at all. Especially this year with being able to come outside and enjoy the air in Camp Driveway. And today was another beauty! We took advantage of the great weather to get some outside stuff done. First, though, we took a trip to Albany to the Goodwill store. Good-bye, leftover boxes! And then Harry spent some time washing the truck and the fiver. He had to wear his wide brim hat today because he got way too much sun yesterday working at the sale to get rid of our stuff. In the meantime, I was cleaning the garage! Look, there really was a floor under there!! It seems so nice to have that yard sale behind us. Our next order of business will be one that we just decided on today. We have decided to sell my car now as opposed to waiting until next spring. So this week we will take the car to get it detailed and then we will list it. It will make our driveway a lot less crowded, our insurance bill a little nicer, plus we won’t have the truck just sitting around for weeks at a time. Also, used car prices for Honda vehicles are up right now, so it is a good time to be selling. Haha – maybe I’m just in the mood for getting rid of more stuff…let’s see…what can we get rid of next? and carting stuff off to my sister’s office for today’s yard sale. And today it all came together. We had a huge amount of stuff for this sale! The first two tables and the stuff on the ground around those tables is almost all from our place. The sale was a great success! We sold almost everything. This is all that’s left. And actually we even got rid of something in this picture – the green storage bins are gone. The only thing we will keep for now are the skis, poles, etc. We will sell those when it is closer to winter and people are more in the mood to think about winter sports. The rest is still sitting in the back of our truck, and we will take it to Goodwill in the morning. And then…time to clean the garage – that’s tomorrow’s project. Yippee! So much stuff gone! AND, we made $203.10 for our rv startup fund. A very good day. AWESOME news!! Harry found a juncture box under one of the slides. He opened it and saw…. a LOOSE wire!!! He tightened the wire AND….microwave outlet problem solved!! Woohoo – no trip to CT next Wed. for us!!! It’s been a good week, busy with getting stuff organized for our sale tomorrow. I’ve heard from my sister that a few of our items have already been purchased before the sale even starts, so it sounds like we’re off to a good start. For the past couple of days, I’ve been following the story of a little girl’s birthday wish that has blossomed into something so much more. It is a sad and tragic story that seems to bring out the best in the many people who have read it. I can’t possibly tell the story as well as the news article, so I have included a link to it. Also, here is the link to Rachel’s donation page. I don’t know what it is about this story that has touched me the most. Maybe reading the comments of the people who have donated in her honor and memory. Or the power of people to make a difference when they come together. As you scroll through the pages of donations, many of them are a small donation of less than $10. And only 17,000 people have donated so far, which is such a small percentage of the total population of just the US. And yet, over $600,000 donated the last time I looked at the website. Wow. What people can do when they are working together. This is not a political blog, so I won’t say more than just this one sentence…maybe the US Congress should take a look at this little girl’s story, and learn something. This morning we had our first outing with the fiver – nothing too exciting, but we did hitch up and move out of the driveway. Today we had to take the fiver to be inspected. We had waited a few weeks to register in NYS, not being in any hurry to pay the 8% sales tax, but last week we finally had to bite the bullet and pay the tax man. So we had ten days to get the inspection and today was the day. It seemed strange to be putting in all the slides and preparing for a move. Over the past month, things have been left on the countertops and the living area definitely had a lived-in feel. There wasn’t a lot though, so it only took us about 10 or 15 minutes to pick up, stow the satellite and bring in the slides. The place where we got the inspection is only 2 or 3 miles down the road, so it was a quick and easy trip. The process was quick and we were soon on our way back home. Backing up at home went SO great!! We learned from our first time for sure. We live in a development of two connected blocks, which essentially turns the road into a circle of sorts. So this time we came in the other way, so we were pointing in the other direction. Harry backed up, and voila, we were settled in the place we wanted to be on his first try!! We will be taking a longer trip soon though, but not for a getaway unfortunately. Although we have had wonderful luck so far as far as glitches or problems with our new fiver, we have identified one issue that sadly we are not able to fix ourselves. The last time I used the microwave, it worked for about 3 minutes, and then it went off. No clock, no power, nothing. It works fine when plugged into a different outlet, but not when it’s plugged in where it should be. Over the past week or so, Harry has checked what he can – after multiple calls to our dealer. The microwave outlet is consistently showing 86 volts of power, when it should be 118 – 120. The breaker is fine, showing the correct amount of volts there. All the wires are connected, no loose wires anywhere that Harry can find. So the only possible area left for the problem is the actual wire between the breaker and the outlet. It will need to be replaced. So next Wed. we are taking the fiver to the closest Heartland authorized repair place, about an hour and a half away in CT. I have definitely bonded with our new home, because I hate the thought of leaving it somewhere, even for a short time. Hopefully this will be a quick and easy repair job, and very soon we will be able to head back and pick ‘er back up. Well, Sunday was a successful day of moving, and we have so much more room! We weren’t sure how well this desk would fit through the doorway, but Harry removed the door from its hinges and the desk went through with about an inch to spare. The credenza came apart and headed out in two pieces. It was still heavy though. All of the furniture going out today was really heavy. We were very glad that we weren’t the ones carrying it. The hutch is emptied and all of the dishes are packed away in boxes. They will be going to MA in September. We had the movers bring the hutch out into the garage. So now we only have to move the hutch from the garage to a trailer. After we moved the hutch, I figured out where all those mice toys I bought for the cats have gone. They were hiding behind the hutch! Ariel is trying to figure out which one to chase first. From the bedroom, we moved these two dressers and that huge tv!! All gone to their new home. We also moved a huge truckload of yard sale stuff to my sister’s later in the afternoon on Sunday. But we were a little more involved with that move, and I forgot to take pictures. Whoops! But it definitely was a successful weekend. We feel like we have made a lot of progress this summer. And it’s not over yet – we have the yard sale this coming Saturday and more furniture going out in September! Moving in the right direction! It has been a busy few days around here! Since Wednesday, we have been working, of course, ho hum. And also, getting ready for a moving event, and a yard sale event. Today we worked most of the day pricing items for our upcoming yard sale, which takes place next Saturday. We took a break and headed into Albany for a wonderful dinner at Olive Garden, which was made even more wonderful when we discovered that we had a gift card which covered the entire balance. After dinner and arriving back home, we finished up getting ready for the big move of several pieces of furniture to Andrew’s place tomorrow. I was about to say that we were hoping that the move would go on as scheduled, since the movers had not yet confirmed for tomorrow’s date and time. However, just as I was writing this, my phone rang! Phew! We are all set! I will have lots of pictures of our furniture heading out the door to share tomorrow night! Tomorrow will be a busy day. After the movers are finished, we are going to be packing up the truck to take the first load of yard sale stuff to my sister’s house. By tomorrow night, we should have a lot moved out of here! Can’t wait to see what the house looks like with less furniture! We met with the realtor last night to hear the results of the market analysis. We were a little apprehensive to hear the reality of our situation, as opposed to what we might be hoping for from our house sale. The news wasn’t terrible, but it wasn’t all great either. The median price for the homes which are most comparable to ours is pretty close to what we were hoping to sell our house for. So that was a relief not to hear a number that was $30 or $40k less for a starting price. So that’s the bad news. One other positive point is that we still have 17 months before we will be listing our house for sale. So hopefully the market will improve, even somewhat, before then. By next October or November we can see how many of these homes have sold, and how much they sold for, and can use those numbers to hopefully price our house for a successful sale! Definitely seems like a strange title to begin with when all around us, the heat is on. Actually, it was probably about this time last year that I used that phrase for another one of my blog post titles. But this year, we can escape the heat in our new future home. So that’s what we’ve been doing. Right now we are both hanging out, checking out our various faves on our computers, and watching a little tv. We are lucky that our wireless internet is strong enough that we can connect to it out here with a really strong signal. We have the cats over here with us, but we will be bringing them back over to the house before we head to bed. They are really adapting well, and tonight is the first time that they seem to be settling down quickly. They didn’t even “complain” when we brought them over tonight. However, our last experience on Saturday had its ups and downs. They did pretty well during the day, and I thought they had really started to get used to their new digs. But then we went to bed, and Ariel decided that enough was enough, and she was ready to go home! She basically walked on us, meowing, for most of the night. By the next morning, we decided that we will give them a chance to get more used to the place before we keep them here overnight again. The next overnight test will be in September when we go to Lake George for a few days. Tomorrow evening, the realtor will be coming over to share his findings with us. It will be our first major “reality check.” Even though we have about 17 months until we put our house on the market, the reality is that the numbers aren’t going to change a great deal between now and then. So tomorrow we will have a better idea of what we can expect to be working with when we put the house on the market. More driveway camping! And we are lovin’ it! We do have a reason though, other than just to enjoy ourselves out here. While I was at work this morning, Harry continued the project of staining the trim around the windows. He worked on the large window in the living room today. Since the smell of the stain is a little oppressive, we have moved out to the camper for the night. All of the windows downstairs have now been stained, except for the sliding glass door out to the back deck. Upstairs only the bathroom and our bedroom need to be stained yet. This will be a HUGE item off our to-do list for the year when all of the window trims are stained! 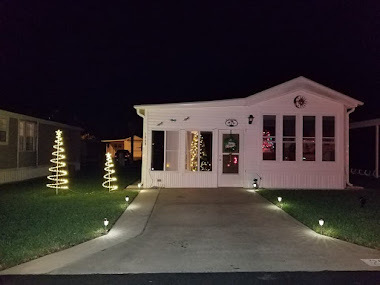 We have been enjoying the air conditioning out here in the rv, and are really glad that we had the 50 amp outlet installed in the garage before we headed down to Tennessee almost a month ago. I was also very glad to see on our National Grid account that having the fiver plugged in for three weeks only increased our bill by about $14. Our new Serta 4 in. memory foam mattress topper came on Wednesday, and tonight will be our first time sleeping on it! We love the memory foam topper on our bed in the house, and bought a thicker one for the bed in our fiver, so we are both excited to experience how comfy our bed will be now. We have had the cats out here most of the day, and they are starting to settle down. They haven’t been doing so much pacing and complaining!! We have an appointment with the realtor on Tuesday to hear the results of his market analysis. So that will be informative, and hopefully positive. We will be finding out soon. Guess that’s it for the potpourri of “stuff” going on around here! I enjoy my mid-week day off. It’s a nice respite in the middle of the work week, and always makes the work portion of the week feel a little shorter. The weather is beautiful. It’s a wonderful sunny day, with a pleasant breeze blowing in the window, and a forecasted high of around 80 degrees today. The short summer months are definitely the best time to be up here in northern New York, and all over the northeast (well, unless you are a skier or some other winter sport enthusiast, which I am not). It’s the wonderful summer weather that helps us feel really positive about our fulltiming plan. Anyway, back to the present….yesterday, I started organizing our piles of stuff for the sale we have coming up. What a mess! I don’t know how many more sales we will have. After this one is over, I think I may just donate or pitch the items that are left. It sure is a lot of work for what will probably not be a lot of financial return. Yes, there really is a floor somewhere under there!! You can see what our project for the next week or so will be! It is hazy, hot and humid tonight. But, we are cool and cozy …and…. hanging out in our driveway. We ordered a memory foam mattress topper, which will be coming tomorrow. However, we will suffer through tonight on the mattress that came with the fiver. We brought the cats out with us, and hopefully they will start to settle down one of these times, as they get used to their new surroundings. If I can’t see you, then you can’t see me. They aren’t making too much noise, but they keep pacing back and forth, and we have to be super careful when one of us goes out the door that they don’t make a break for it! It surprises me a bit that Ariel would try to go out the door, as she has always been an indoor cat, and has never seemed even a little bit interested in going outside. Right now, though, she seems to be operating under the premise that any place is better than this strange place! I am off from work tomorrow, and the weather is supposed to be a little nicer, a high of 80 and lower humidity. We have scheduled a yard sale for the 30th of July, at my sister’s again, as we did last year. So tomorrow’s project will be to start organizing all the stuff in our garage, and pulling it all together for the sale. We had another great weekend, accomplishing projects or at least making a great dent in them. I spent much of Sunday working on my recipes. I have scanned 220 recipes now – which includes 2 binders, a number of recipe cards out of a homemade style cookbook, and numerous other newspaper clippings and inserts that I have saved over the years. Even if we were not getting ready to downsize into a smaller space, I would be happy to have all of that clutter out of the cupboard. It also has given me another great idea. I have TONS of newspaper clippings and papers printed from online sites having to do with genealogy research that I have done over the past years. I am going to scan them as well. As long as I back them up, it seems so much more secure than just hanging onto printed copies, which are already starting to fade from age. Harry spent time on Sunday continuing his work on the trim. He finished the bathroom window and the two windows in the office. Next weekend he is going to work on the large window in the living room. More progress! And in the process of going through my recipes, I even found one for mac ‘n’ cheese which I thought looked as good as it did the day I cut it out of whatever magazine it came from. So I headed to the store for a few ingredients and made it for dinner yesterday. Maybe when we head out on the road, I will actually have time to try some more of these recipes I have been accumulating for years! This has been another productive few days. We are making lists and crossing off items to stay motivated and keep ourselves moving forward. We have almost all of the furniture ready to go in two weeks. I have the desk all emptied except for one drawer. I did put some items in a small box to be sorted out – pens, keys, small pads, scissors, and other miscellaneous items. No real exciting pictures, but a few empty drawers to show for the day’s work – which is exciting to me! Harry, in the meantime, was working on plugging up some more areas in the fiver. He has also ordered some cleaning solution and supplies from Camping World so that we can wash off the "road” dust and the “sitting in one place” dust. Harry also working on staining trim, and has finished two more windows. We have four rooms done, and five to go. We are almost halfway there! After working on the desk, I started scanning my recipes. I have scanned 63 recipes so far. I plan to work on those some more after dinner. It is so great to know that I have one whole binder’s worth of recipes scanned already! So that’s it for news from our little corner of the world - nothing too earth-shattering going on, but some slow and steady progress! Well, I don’t know if we need it, but we are enjoying some anyway. Since it’s a hot and somewhat humid day, we decided it was a nice afternoon to come hang out in the comfort of the air conditioning. Harry took advantage of the time to work on hooking up some new cable to the tv and sound system. We brought the cats over, to give them some time to get acclimated. Ariel was waiting for someone to come over to the door so she can make a break for it, out of this strange place! But after awhile, they started to settle down a bit. Ariel is way in the back, near the wall. She always likes to find secluded places to hang out. So earlier today, we met with the realtor. He seemed to appreciate the amount of work we have done around the house. This is the dining room. This table and chairs will be taken to Harry’s daughter sometime in August. We will bring the smaller table in the kitchen into the dining room and open it up. This hutch, along with the dishes, will also be going to Gretchen. We are happy with how things are moving along. The next project we intend to tackle is to finish staining the windows. The realtor will give us a call next week, and will be coming back over to share his findings with us. I have a number in mind that I am hoping for as a minimum, but we shall see.